Do you have white toenails or white spots on your toenails? Let’s get to fixing this ugly problem right away. Step 1: Let’s do some basic diagnosis and try to find the cause of your white nails. If you do, then speak to a doctor urgently. If not, then let’s move on. Chronic liver disease as a cause is less common than injuries or fungus. Also, white nails are going to be one of the later symptoms of liver disease. You’re likely to experience nausea, vomiting, abdominal pain and jaundice before you get white nails. So, if you have white nails without any of the other symptoms you can likely discount liver failure as a cause. If you have white nails and are experiencing nausea, abdominal pain or yellowing of your skin, see your local doctor immediately. See your local doctor as soon as possible for a check up. This could be a serious medical issue and should not be taken lightly. Professional qualified medical assistance will help return your health and nails to normal. Only a very small white spot? Small and minor injuries to the nail and cuticle whilst the nail is growing can cause white spots. These are harmless and simple appear as a small white mark or chip on the nail surface. To avoid injuries and the resulting white spots avoid biting your nails and harsh manicures. If your whole nail or a large part of your nail is whitening, then you might have fungus instead. Unless you’ve had a memorable injury (like jamming your finger in a car door accidently), only a very small part of the nail is likely to be white. So, if a large part of your nail is whitening then you might have fungus. If you have white spots from injury, unfortunately you are just going to have to wait for the healthy nail to grow out. Prevention is better than cure for white spots on nails caused by injuries. Avoid getting manicures and pedicures. These beauty procedures can damage the cuticle and fresh nail growth at the base. When this fresh growth finally emerges, there is the chance you’ll have some white spots on your nail. If you play sport, ensure you cut your nails short and straight. This will reduce the chance of injury (especially in ball sports such as basketball and netball). To avoid nail injuries, make sure you have the right footwear. Shoes should not be too tight or too loose. Shoes should really allow half an inch between the shoe wall tip and your big toe. Also if you work outside or in a blue-collar job (for example on a building site), you should consider using steel cap boots to prevent injury. Nail injuries can also lead to fungal infections. An injury can weaken or expose deeper parts of the nail allowing fungus to get in deeper than normal. If you do get a nail injury ensure you keep the nail clean and dry to help prevent infections. If you start to see fungal growth (white or yellow nail), try treatment with a topical product like ClearNail Pro+ to stop the fungus early. White spots or areas on multiple nails? Nail not growing out properly? It’s likely that you have toenail fungus. Toenail fungus causes toenails to change color, usually to an unsightly yellow, white and/or green color. If left untreated the fungus will attack the nail. The nail will thicken and eventually begin to crumble. Also, if left untreated the fungus can spread to other parts of your body or other people you live with. Read more about toenail fungus and treatment options here. It is important to keep your nails healthy and fungus free. Starting treatment early and keeping up treatment is vital. As toenail fungus and foot fungus is very contagious, you don’t want to spread it to other toes or even to other friends and family. If you have toenail fungus, avoid sharing bathmats and towels with other people in your family or others you live with. Also, a really good tip is to put your socks on before putting your underwear on. This way you don’t accidentally touch your fungus infected toes against your underwear when you put them on. This will help stop the fungus spreading to your groin, which would give you jock itch. There are no reputable and proven home remedies for white spots caused by liver disease or toenail injury. There are some home remedies for toenail fungus, though they often can take a very long time to work. Vicks VapoRub, Listerine mouthwash and vinegar are often suggested as home based cures. Sometimes home remedies aren’t all they’re cracked up to be. You can read more about the home remedies here. Otherwise, stick with the medical treatments we mentioned above and you should start to see results. Get started today, keep it up and you’ll have your nice feet back again before you know it. Good luck and good health! 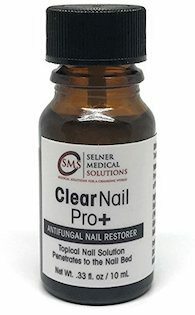 Learn more about ClearNail Pro+ – my recommendation as the best treatment for toenail fungus. I only notice my big toenail turning white when I use nail polish. What could cause that? This could be because the nail polish prevents the nail from breathing properly. One of my middle toenails started turning pearly white when I use nail polish. After reading that it’s probably a fungus, I stopped using polish for a couple weeks and used one of the OTC ointments for athlete’s foot. It went away in a few days. Started using polish again (just one clear coat) and it came back. Now I’m back to using the athlete’s foot cream and it’s gone again. I plan to use the ointment for more than a few days this time and to stay polish free much longer. I’m having the exact same issue. With it being on my big toenails only. I wasn’t sure if it’s because of wearing nail polish though because I always have nail polish on. I’m hoping that is the cause and not fungus :/ Has anyone gone to the dr with this issue? I only noticed it when I took my nail varnish off, it my big toe the nail is completely white. I am on a lot of medication as I have a spinal disease. Been feeling unwell since Thursday, I had spinal injections, and have felt very unwell since. Feeling very nauseous, head not feeling right and no energy. Please consult a doctor about this issue. I am noticing a few friends with this along with myself. I only paint my toenails in the summer and all 3 of us use OPI. , I do my fingernails weekly. I used to manage a cosmetic counter for a drug chain in Canada and the only thing that ever happened with constant painting was a yellowing tint not this white spot. Really feel this has something to do with the nail-polish/brand this is not a fungus. Same thing is happening to me and I also use OPI on my toes! This is happening to me this summer I switched to OPI, I wonder if that is the problem. I have the exact same thing….the big toes after I have worn polish all summer and want to be free of polish in the winter when it is too cold where I live to wear sandals. So this may not be toenail fungus? How can I get rid of the white marks? If I file it down, the nail gets too thin. I had white spots on my big toenails I put tea tree oil on overnight the spots were gone by the morning. I’m on seraquel for depression and anxiety and feeling really sick… I noticed my big toe nail is white can this be caused by various medicines u r taking? In this situation, please speak to your doctor to confirm whether this is caused by drug side effects as well as possible treatments. Hi there, I’ve had the yellow big toe toenail in the past – from not allowing the nail to have enough access to air due to constant nail polish. If I gave my nails a chance to “breathe”, it would go away. Last year, I experienced the white covering on my big toe nail after removing a coat of nail polish. I went to a foot chiropodist and he said it was a fungus. He buffed it down, but it thinned the nail a bit. A year later (with barely wearing toe nail polish) some white spots have shown up – brittle like. Have to go back to see what’s up. Only get the white stuff on my toenails. I only use clear polish (Nutra Nail Touch of Color Strengthener with Green Tea Antioxidants) on my fingernails, and it usually only stays on for two days or so with washing dishes, cleaning and such. I’ve just stripped everything bare, trimmed and started Tea Tree Oil on toenails today, twice a day. Will let you know how I fare. I live in Florida so this is not going to be fun, but if it works I’m going to Whole Foods and buying clear polish without formaldehyde and will use this as a base for colored toenail polish (also from Whole Foods). If I’m going through all this I don’t want it to happen again! Having a case of nail fungus isn’t fun, and it’s definitely worth taking every step possible to prevent future reinfections. My toenails went white since I’ve been having pedicures. Sounds like it may be a case of nail fungus then. Consult with your doctor and see what he/she says. My toe next to my big toe and my little toe are both covered in white stuff all over the nail. It’s like the nail is crumbling off and it does not look healthy at all and you can really notice it. None of my other toenails have it its just them 2 on my left foot. I don’t know what to do! My little toe only has a tiny bit of toenail left its like my toenail is falling off…please help! It sounds like it could be nail fungus. You could try one of the options that I’ve listed on my site, although you should consult with your doctor to confirm that nail fungus is indeed what is causing your crumbling nails. White vinegar applied to the nail 3 times daily will cure the fungus. I am very selfconishois about my feet. I hate to see people with ugly feet and go to a great deal to work to take care of my feet and keep them healthy. I had white spots on my big toe nails and I knew what it was. Fungus. Anyone can get it and it’s easier to get than u,think. I flipped out and said hell no not on my feet. I applied white vinegar to my toe nail 3 or 4 times a day for 5 months. My nails are pink and healthy again. Do you continue the treatment to avoid future fungus problems. I get this on my big toenails only in the summer when I use polish. Agree with Jeff on keeping feet nice. Never have used polish, and have one nail that looks white. First time in 45 years! I’m going to try vinegar, and if that doesn’t help I’m going to doctor to pay whatever it takes. I’ve noticed white flaky spots on my toenails since I have been using a maximum strength acetone nail polish remover. It is a professional grade remover 4 gel and artificial nails and nail glue removal. I think it may be too strong for my toenails, it doesn’t have this effect on my fingernails but since I’ve been using it on my toenails I get the white flaky spots. When I don’t use polish over the winter it goes away but now in the summer it’s back again! Took off my toenail polish last night only to see white, rough patches on one big toe nail. I read on this site today that Tea Tree Oil was mentioned as a remedy. It just so happens that I had a brand new bottle in my cabinet that I bought for some other purpose, long forgotten. So when I was cleaning out my cabinet this morning, I threw it out! Fortunately, I had not taken the trash out, so after reading Shelley’s post I retrieved it and will try it today. Just had to share this coincidence and say thanks to Shelley! Mine are white sets on all 10 toes. I put Vicks on it at night , and the next day it was gone , i couldn’t believe it… one treatment…. so I’m a believer in the vicks…. I’ve been using Vicks ever since I was a child and I’m now 75. (My grandmother swore by Vicks) I’m never without a jar or two. I use it for everything, including an abscesses tooth to relieve pain. However directions say to only use it externally. I never thought to use it on my white toenail, but I’m starting tonight! I had the same problem, I also think it’s the Polish I have used. I am alarmed to hear that if I ha e nail fungus I have to be careful with all my family members… I do seriously believe it’s not fungus, and it may be a chemical added to the nail polish. For anyone who has problems with fungus on your toe nails. I have the solution. Thank God. He has lead me to watched a video recorded by a physical trainer who went out of his way to help his sister, who was about to commit suicide. He was reminded about the regiments that the boxers use before a fight in order to qualify for a certain weight division. So what I learned, is that we need to clean out our digestive system. That is where all our problems start….What he recommended is to excise and drink plenty of green tea with antioxidant before you go to bed, and eat high fiber fruits and vegetables. I’m currently on my 12th day. I have currently lost 14lbs and the swelling on my knees is subsiding, my toe nails are looking better. Thank you Lord! Hi everyone! After reading numerous websites and tempted to buy an expensive fungus treatment , I decided to search other options. I read about tea tree oil , so I went to Walmart and got 2 bottles of tea tree oil and I paid pl one for my toenails and another one for my nails, it was 3b per bottle . I went home , removed the Polish and my nails were even whiter than before. I grabed cotton for each one of my nails as soon I dipped the cotton on my nail I would trow it away in case was fungus I did not want to infect the rest of my toenails. I waited 10 mins then I rinse let the warm water just fall on my nails… then I dried them . The next morning everything was gone, but I still did the same procedure a let the oil stay in the nails and then I went into the shower and let it just wash away. This is good, and my nails look beautiful . I noticed this white powdery stuff on one or two of my toenails while I was having my last pedicure about six weeks ago.If I had not shown this to the girl doing my pedicure she would of left it and just continued to polish my nails.I asked her to use the file and removed it myself.Did she throw out the file? No.This was my second visit to this salon.I have never had this.I used a store bought gel polish.Could this be the cause? Or could it be something I picked up in the salon?I will not be going back there again.The girl spoke non stop with the other staff in her language and did not seem to be interested in her job. Thank you. I’m going to try the tea tree oil! I hope it works as well for me . I have them on my big toe only as well, ever scene I’ve got out the hospital with blood clots. Can this cause this. I hate it I’ve tried everything but going to my DR. because I’ve searched the information on what they put you on and its very bad for your health. Coconut oil would fix it I think. I used to have a terrible case of toenail fungus. I wore socks day and night year round. My toenails became very thick, yellow and growing sideways. I could never wear sandals or flip flops. I tried prescription, oral medication for 6 weeks, didn’t work at all. I tried all kinds of OTC topical meds, didn’t work. Finally, I began using undiluted tea tree oil. Since my nails were so bad it took a couple of months for my nails to completely clear up, but now I’m a flip flippin mama. One tip is let your feet get air, keeping them in socks all the time promotes the fungus. I also use the tea tree oil every few days in winter and once a week or so in the summer to keep my nails looking great. Tea tree oil works on skin tags too. I’m Australian and have used Tea Tree Oil made from “Melaleuca alternifolia” for over 40 years, it is best used when diluted into an ointment or cream as over use of 100% oil can be dangerous. Living is Australia I have easy access to a particular brand which make many types of Tea Tree products from toothpaste to soap, good luck with your fungi. So, I’m not sure if I have toenail fungus or a thick toenail. Last I wore socks around the house all the time and I usually end up standing in a small puddle when doing dishes, I guess my stupidity for not changing socks instead of just warming up by the heater… I also tripped and injured my foot and knee so I’m not even sure which is the actual cause. Anyway, since about last February I have had this very nasty white growth on just my little toe, it has not spread to any other nails. It was growing off the end of my toe and I continue to cut and file it away just for it to grow back. I ripped the side of my toe trying to rid this thing so now it’s white as well.. I have looked at pics of both thick toe nails and toe nail fungus, it looks a little like both except it’s white and so far I have not found any pics white thick toenails; they all look yellow to me. I have tried vicks vapor rub and apple cider vinegar thus far trying to treat it.. I am currently treating it with clotrimazole (which apparently only works for .07% of toenail fungus), apple cider vinegar soaks and neosporin… So far all I have managed to accomplish is preventing the extra growth off the end of my toe. I file daily it with both a foot file and a fingernail file, and cut some of it away with scissors but every time I think it’s working it covers the side of my toe again. In the beginning I really had no symptoms other than hot itchy feet under the electric blanket, wake up in the middle of the night to kick the blanket off every night. Only time I experienced any pain was when the dog would step on my feet. Lately now it tends to burn when I’m trying to sleep, and hurts when I shoes on (loose shoes). I have dark white on both my big toenails, and I do not put nail polish on them. Toe fungus? I noticed this for the first time on my big toe, it was right after I removed the nail polish. I purchased the nail polish at the dollar store. No more cheap nail polish for me.